Renee introduces everyone on the panel and Rich Brennan in the Social Media Lounge. 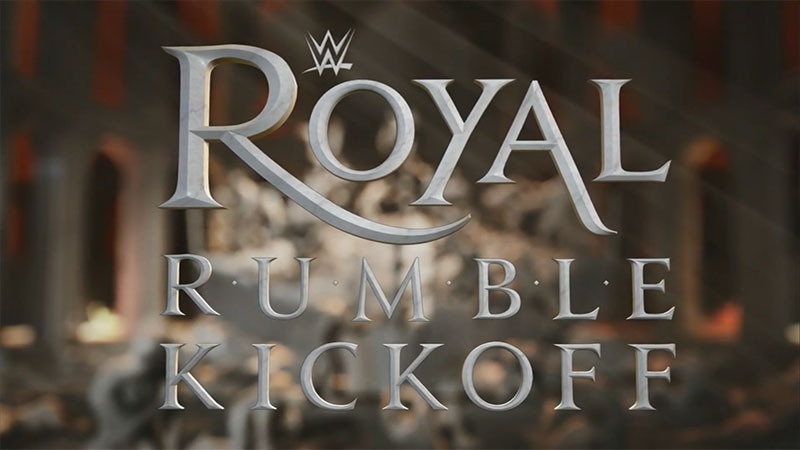 Royal Rumble by the numbers. The panel discusses Reigns’ chances in the Rumble. Graves says there’s no chance. Lawler says it’s possible but unlikely. Booker just says it’ll be tough. They also talk about how dangerous the Wyatt Family is going to be. Some Rumble victories are shown. First is Del Rio eliminating Santino to win in 2011. Then it’s Sheamus eliminating Jericho to win in 2012. The League of Nations has a pep rally in a tiny room with four flags. They agree that one of them will win the Rumble. Lawler says Kalisto has no chance. Booker says Kalisto has it. Graves agrees with Lawler. Shawn Michaels wins the 1995 Rumble from the number one position. Vince McMahon wins the 1999 Rumble from number two. Recap of the Owens/Ambrose feud. Jojo has Kevin Owens. Owens assumes what her question will be. He says he will win because he’s Kevin Owens. The panel talks about how dangerous a Last Man Standing match is. Booker says that it’s Ambrose’s type of match. Lesnar winning in 2003. Rock and Big Show both going over in the 2000 Rumble. This was a fun match until the end. It started with a fast pace and everyone doing something. Sandow got the best reaction out of everyone. He got a few chants and people booed whenever someone hit him. It was really great to see Sandow in the ring and he looked like he was really excited just to be out there. There was no clear dominant team in the match, but The Ascension did control it for a while which slowed it down a bit. And for some reason they put a commercial right in the middle of the match. You could even still hear the crowd while the commercial was playing. It was rather annoying, but not unexpected. The match was fine until the last segment. There was an awkward moment where a guy seemed to get into the ring way too early because he should have been helping his partner out, but he just stood there and waited for someone to attack him. It was very, very obvious. Also, the team that won had an awkward exchange where the guy goes like he wants to pin one guy, but has to be told that the other guy in the ring is legal so there’s an awkward moment where he has to switch who he’s covering. I’m pretty happy with the winners though. I’ve actually been pretty supportive of this team over the last few weeks and have wanted to see them get some recognition. Looks like the people in the back agreed with me. The Social Outcasts kick Rich Brennan out of the Social Media Lounge. They answer questions from Twitter. They first reluctantly agree that there is no weak link in their group. They say that they don’t fit in. Slater says he’s the leader, but no one else seems to agree. Dallas says they’re all equal. Axel says he’s not tired even after being in the Rumble for nearly a year. Batista eliminates Reigns to win in 2014. Reigns eliminates Rusev to win in 2015 to a chorus of boos. Recap of the Lynch/Charlotte feud. Booker T names the Divas match his “Shucky Ducky Quack Quack” moment and picks Becky. Graves disagrees. Lawler agrees with Graves. The panel discusses the Rumble match and reiterates what they said earlier. Booker picks Reigns to win. Lawler picks a surprise entrant to win. Graves picks Lesnar. The show did its job. It got me pretty pumped for the Rumble.